Newspaper clippings from the January 15, 1971 edition of The Chicago Maroon, including a report by Gordon Katz on the indictment of Eqbal Ahmad and five other defendants for involvement in a conspiracy to kidnap Presidential aide Henry Kissinger and to bomb the governmental heating system in Washington D.C.
"Ahmad suspects FBI agents in Robie raid"
Newspaper clipping of an article from the February 2, 1971 edition of The Chicago Maroon. 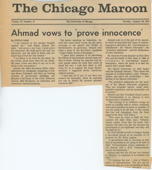 "Ahmad vows to 'prove innocence'"
Newspaper clipping from the January 26, 1971 edition of The Chicago Maroon of an article by Steve Cook. Eqbal Ahmad, indicted for conspiring to kidnap Secretary of State Henry Kissinger, vowed to prove his innocence in court. However, Ahmad added, "I am likely to be tried for my ideas, for my words, much more than for my deeds." Newspaper clipping from The Chicago Maroon dated January 22, 1971 of an article by Jim Haefemeyer on the decision made by Judge James Parsons to stay execution of an order to transfer Eqbal Ahmad. The article features a photograph of protesters picketing outside the Everett Dirksen federal building to demonstrate support for Ahmad.